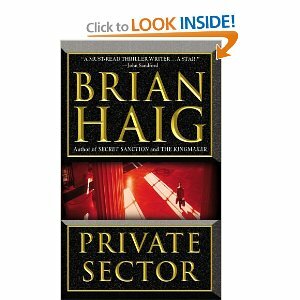 Here is the 4th book in the Brian Haig series. I found this book to be gripping. I could not put it down. It is a big improvement to the last book I read by Haig (the Kingmaker). The story really is amazing and for those of us that love a good thriller this is it. Haig’s wisecracking J.A.G. attorney Sean Drummond returns for his fourth caper in three years (after January 2003’s The Kingmaker). Unpopular with his military superiors because of his sharp tongue and his tendency to attract trouble, Major Drummond finds himself loaned out to a private law firm. Culper, Hutch, and Westin represents some of the District of Columbia’s most staid, old-line institutions, and Drummond begins ruffling feathers from the moment he arrives, though he does prove surprisingly popular with some clients. Meanwhile, a serial killer is taking out attractive young professional women. The first victim is Lisa Morrow, Drummond’s sidekick in Haig’s debut thriller, Secret Sanction, and also a military lawyer working for Culper, Hutch, and Westin. In fact, Lisa’s on her way to meet Drummond when she’s murdered. Chapters from the obsessive killer’s dark perspective alternate with Drummond’s cheeky first-person narration. Not happy with police progress on the case, Lisa’s sister Janet, also a lawyer and a dark-haired beauty, steps forward to help Drummond investigate, even as victims pile up. Both Janet and Drummond prove to be entertaining thorns in the side of crusty police detective Spinelli, the officer in charge of the murder investigation. Haig introduces related subplots featuring corporate greed and criminality, but they don’t have the visceral chills or the sexiness of the serial killer story line. In the end, it’s all about Drummond; though the novel is overlong, the hero’s sharp and devilish style should keep reader interest high until the surprising conclusion.